What Does Big Ag Look Like? Early this fall everyone – farmers, ranchers and eaters alike – were talking about the New York Times’ Food for Tomorrow conference, its mission to discuss eating and farming better, and the fact that not one solitary make-a-living-off-the-land farmer or rancher was listed in the speaker line-up. One Huffington Post blog captured what so many were thinking. If a group of “thought” leaders and food activists like Michael Pollen and Mark Bittman were going to discuss food policy shouldn’t farmers be at the dinner table? Thankfully, the U.S. Farmers & Ranchers Alliance stepped up as a conference sponsor and hosted a panel discussion – with farmers – titled “Big Ag, Big Food: How Being Good for the Environment Is Not about Size”. Watch the video of this panel discussion at fooddialogues.com. And the change seemed real as Bittman, clad in a “Team Iowa Beef” t-shirt, insisted, repeatedly, that farmers were not the ones under attack. We are a family, he said. The food movement includes farmers too. However, Bittman quickly made clear the type of farmers included in his movement, and it wouldn’t be those who grow corn and soybeans, farmers in cahoots with Big Ag. Down on the farm, Big Ag arguments fall flat. They are tiring, old and annoying. The Big Ag debate is similar to the corporate farm debate. The faceless entities so many claim as evil, have faces. In farming communities across the country these faces are those of our neighbors, our friends, and our family. Faces of the people who keep our communities running, economies strong and people at work. Down on the farm things really aren’t that big or bad. So, we raise corn and soybeans, as do a lot of Midwestern farmers. I’ve said it before, we live in north central Illinois with an average growing season, fairly decent rainfall and winters that test the most experienced cold-loving soul. History has given us an economic system that supports corn and soybeans. Not only do we have the climate and soils to produce these crops well, we also have the infrastructure, market accessibility and workforce. There are reasons why certain things are grown in certain places. It doesn’t always have to be about a BIG conspiracy theory. Big Ag in my county looks like 835 farmers (the number reported in the 2012 Census of Ag). I’d venture 95 percent of these farmers are the third, fourth, or fifth generations of their families to farm. In our country block, a farm family has welcomed home their sons making changes to include this next generation. Big Ag looks like our seed representatives who hail from many companies, not just one, and who are also neighbors or former high school classmates. The truck drivers who haul our corn, again neighbors, former classmates. One driver is the mayor of the village to the east of our farm. The mechanics who work on our equipment at the local Deere and Case dealerships are our neighbors, too. In fact several of these folks will join our family in our post-harvest celebration dinner. Big Ag looks like no-till farmers, minimum till farmers and those who plant cover crops. It looks like farmers who fertilize fields with nitrogen or manure from a neighbor’s cattle farm. Big Ag looks like the group of guys and gals that showed up November 8 to finish harvest for a young farm family who needed to catch a break. Seven combines, six wagons, ten trucks and 35 farmers showed up. Big Ag is the eighth generation of our family’s farm spending hours after school in the field with his grandfather, learning about the farm, the soil, the crops, the weather, gleaning that generational knowledge that seems to be the foundation of the romantic vision of an American farm. Big Ag is my daughter leaving the i-pad behind to dump grain trucks, check moisture and type it all in the computer. She is seven. Listening to Bittman talk, I find his view of corn and soy limited, reminding me of our encounter with two college gals who were biking across country a couple summers ago and ended up waiting out poor weather at our farm. During our visit they made two observations that I won’t forget. “All this corn and not a kernel to eat,” said Catrin. Corn and soy is so much more than food. It is feed, fuel and fiber. It is the plastic of water bottles, the wax in candles, the turf on sports’ fields . . . thinking big doesn’t have to be bad. Maybe one day tomatoes will have alternative uses too. What is missing, has been missing and I’m afraid will stay missing from these food conversations driven by eccentric activists, is a healthy dose of respect and awe for the diversity that is American agriculture. 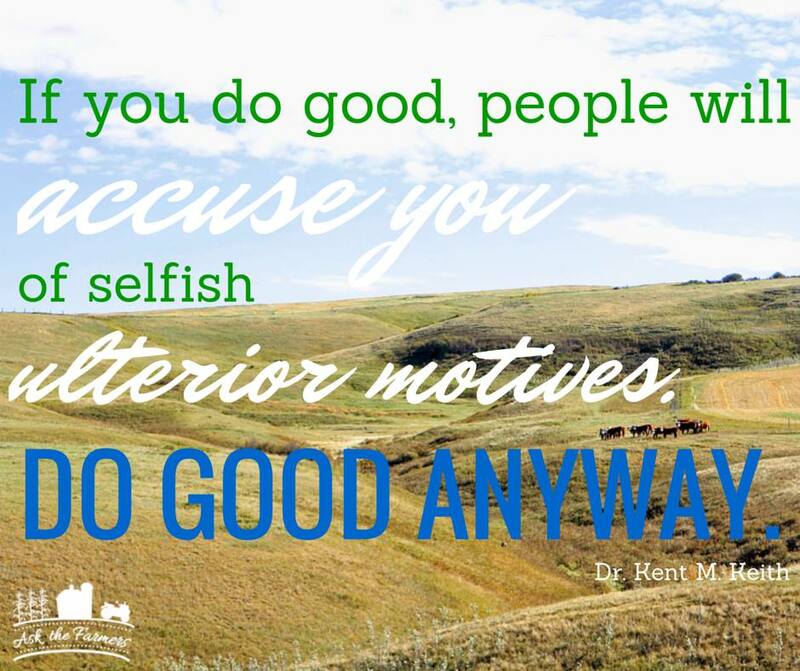 All of us – corn farmers, cattle ranchers, veggie growers, orchard owners – we have been working hard to accept our individual differences and contribute to the national discussion about farms and food. We have opened our farm gates and welcomed questions but more often receive scathing accusations and false allegations, all in the name of transparency. When will the rest of the “family” catch up and recognize that American agriculture takes all kinds and thankfully, supports all kinds. Mr. Bittman. Mr. Pollen. By continually labeling family farmers, sorting us in to bad and good categories, you are systematically ostracizing a key group of people who are as dedicated to the future of food, health and nutrition as you are. My suggestion for next year’s Food For Tomorrow conference: pick a Marriott Hotel, schedule the event in the winter and invite a few farmers. This entry was posted in Farm & Food and tagged Big Ag, corn, family farmers, Food policy, health and nutrition, Mark Bittman, Michael Pollen, neighbors, New York Times Food for Tomorrow, rural community, soybeans. Bookmark the permalink. For a short time I have been enjoying your very positive postings about Agriculture on your blog. I am affiliated with AgVentures Alliance Cooperative, an Agricultural business development cooperative based in Mason City, Iowa. I also farm in Kossuth County, IA. Probably the easiest way to introduce you to AgVentures is to provide the link to our webpage http://www.agventuresalliance.com and allow you to view it at your convenience. I feel that with our mutual interest in Agriculture there may be time where we would enjoy visiting in the future. May you and your family have a very merry Christmas and a happy and successful New Year. Thank you for reading, commenting and sharing the website. Merry Christmas to you! I am a farmer's daughter, a farmers' wife, a mother, volunteer and gardener. My childhood spent on Rural Route 2 was filled with adventure, achievement, and a bushel of disappointments. But an appreciation for hardwork, nature's power, sunrises and sunsets keeps me believing that life on the farm is the greatest challenge tempered by the greatest rewards. 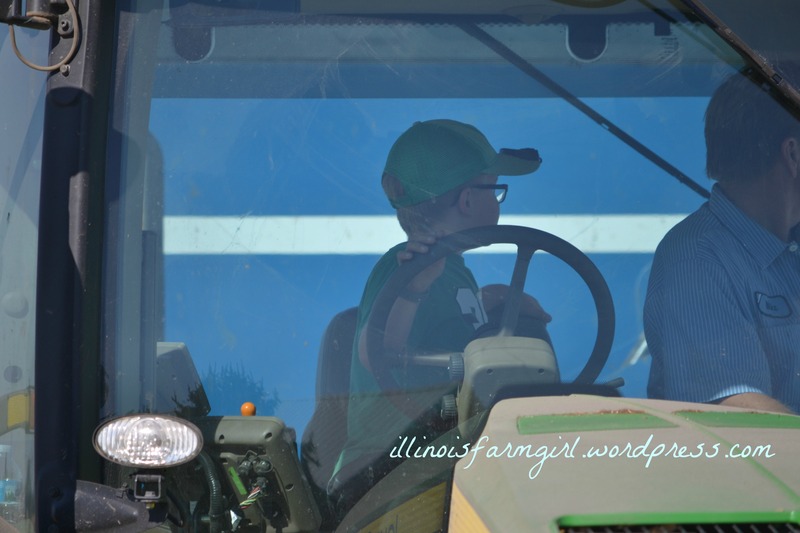 This is the life & times of an Illinois farm girl.